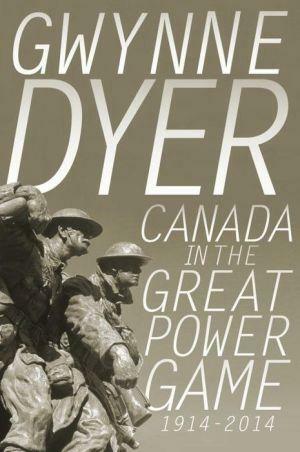 Review of Gwynne Dyer, Canada in the Great Power Game: 1914-2014 (Toronto: Random House, 2014). Pp. 448. Gwynne Dyer’s Canada in the Great Power Game: 1914-2014 is an examination of Canada’s place in the world as it interacted and reacted to the changing international system that governed the world’s great powers. While Canada was certainly not among the Great Powers, Dyer describes how Canadians made their views and influence known (or were ignored in some cases). It is a Canadian perspective on its place in the world, but as a historical work it sometimes suffers from that narrow lens. In its opening pages, Dyer declares his goal to “recount the wars” of the last century and “account for them” (p. 1). He is aware of the nationalizing narratives that often sway Canadian histories of its wartime roles throughout the twentieth century. As such, he consciously takes a position between two extremes of glorifying the sacrifices Canadians have made abroad, or denouncing them wholeheartedly. Instead, he argues that the people running Canada were “intelligent [and] reasonably well-informed,” who learned from past experience as the Canadian position in the world evolved. Ultimately, Canadian leaders challenged “the very basis of the great-power game” and emerged as leaders in the attempt to change that system (p. 5). From a perfunctory role in the Boer War and the First World War, Canada helped fashion an international system after the Second World War that prevented future global conflicts. Even though it is not a perfect system, Dyer writes, organizations like the United Nations and NATO helped end the cycle of Great Power wars of the early nineteenth and twentieth century—at least so far. Herein lies the crux of Dyer’s work, which repeats in various ways as he progresses through the twentieth century. Canada shaped the international system that prevents wars. In his final pages Dyer praises the “job we embarked on almost a hundred years ago” to restructuring the international system (p. 398). Yet few historians would argue that Canada had any major role in shaping those systems—or inspiring their reform. While Dyer readily admits in the opening pages that he has latched onto the centenary of the First World War, his periodization is an awkward one for a book ostensibly examining Canada in the Great Power game. Most historians would not say Canada did much in the “Great Power Game” before 1945. Even afterwards, the alleged “golden age of diplomacy” stretching to the 1950s or 1960s is a title open to debate. Dyer introduces Canada’s influence strongly in the introduction and conclusion, but seemingly undermines it throughout the rest of the work. Rather, his book makes clear that Canada was a witness to the process that changed the international system, but that Canada did not influence that process, except as a contributor of troops, materiel, and convenient geographic location. It is evident throughout that Canadian views amounted to little difference. This is no surprise, as external factors and the Great Powers (or Superpowers as the case may be) had far more influence in the “game” than Canada ever did. Dyer underlines the point that Canadians had no impact on the world other than in their own minds. Robert Borden failed to water down Article 10 of the League of Nations (p. 151), just fifteen years later Walter Riddell’s movement towards its invocation against Italy was ignored (pp. 167-169). Though Prime Minister Mackenzie King was responsible for retreating from that position, none of the League’s Great Powers were particularly enthused about it. Even Canadian diplomats at their peak in the years after the Second World War could not prevent the United Nations Security Council from concentrating power to itself (pp. 257-258). By the end of the Cold War, Dyer emphasizes that Canada’s military had little to no impact on the world, and certainly would not have avoided annihilation had nuclear war broke out (pp. 378-379). Despite Canada’s impotence though, the world is a better place in 2014, as the United Nations created a space for “national leaders [to] draw back from the brink out of respect for international law and the (imaginary) authority of the United Nations” (p. 397). The reader is left wondering what exactly Canada was doing in the Great Power Game. Is it a player? A spectator? An umpire? Score-keeper? Did this role change, and if so, why? With its limited scope that presents Canadians’ assessment of the world, sometimes accompanied by descriptive quotations from international figures, Dyer restricts the history he is presenting. The reader struggles to comprehend Canada’s place on the international stage, let alone the size, audience, and performance on it. It is equally difficult to assess whether we succeeded in our “job” to reform it—or more likely, we are forced to conclude that it was a group project and Canada was there just to receive the final grade. As an entry point for Canadians to learn about their historic views on global affairs, Dyer’s work is a useful contribution, but it is less worthwhile as a work of history. For the majority of the book, Dyer’s argument remains subsumed by the narrative of unfolding international events and Canadians’ views of them. Instead of explicitly exploring Canada’s influence on the international system, as his argument would suggest, he juxtaposes a history of the changing international system with Canadian perspectives on it. The disconnect between argument and evidence is apparent in how Dyer uses his sources, which are inserted in-between his opinionative retelling of Canadian history. These sources are usually excerpts from Canadian or international individuals, rarely contextualized, adding important information but not acting as evidence for an argument. They build a narrative rather than a case, and he asks few questions of them. As a result, there is little evidence other than Dyer’s own opinion of the facts he presents. Canada in the Great Power Game is not meant to be an academic work or reflect on the literature as Dyer is no historian. The work does recount and account for Canada’s wars, and Dyer’s narrative and writing skill is certainly one of the books strengths in achieving that goal. It draws the reader into the subject despite its complexity. Still, as some chapters wander through counterfactual scenarios like if we had not fought the First or Second World War, Dyer’s background becomes obvious. Perhaps it is better to consider the perspective of Peter C. Newman, who writes on the back cover that “Dyer sees the world’s evolutions and revolutions through Canadian eyes.” Indeed, we are treated to Canada’s history through Dyer’s eyes and if you are interested in his view of that history, this book is a worthwhile read. Hector MacKenzie, “Golden Decade (s)? Reappraising Canada’s International Relations in the 1940s and 1950s,” British Journal of Canadian Studies 23, 2 (2010): 179-206.